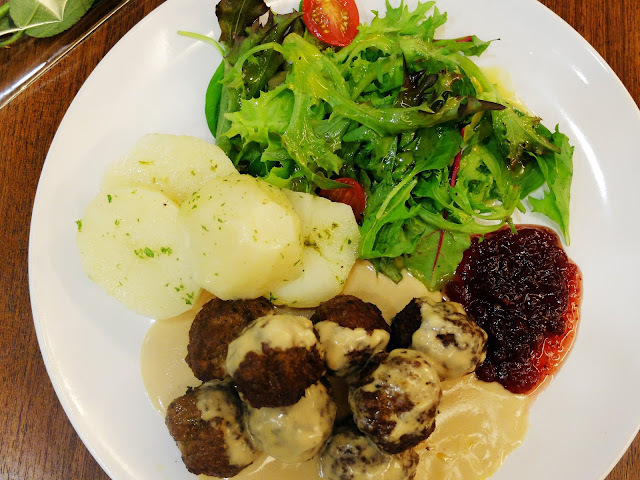 Let's start with their Fika Swedish Meatballs (SGD19.90) which were simply addictive. There's no other way to describe it - I popped these juicy and chewy meatballs one after another in quick succession, pairing it with the buttery homemade cream sauce and lingonberry jam. This isn't a common combination that I am used to, but I took a liking to it very quickly. It is very easy to love these flavours. The parsley potatoes and salad on the side are only 'supporting cast' to the amazing meatballs which can totally hold their own. Definitely recommended to try this! There might be technicalities difference between the pannbiff and meatballs, but the Swedish Pannbiff (SGD21.90) felt like it was very similar to the meatballs in terms of taste and texture. The only difference that I felt was that the shape of the pannbiff is different. The similarities go right down to the sauce and the lingonberry jam too. That doesn't make it bad though, because considering how much I love the meatballs, the taste of the pannbiff is equally awesome. Their extensive menu includes sandwiches, pastas and even savoury crepes. One of these that I tried was the Smoked Salmon Savoury Crepe (SGD19.90) which certainly did not disappoint, a tasty and filling portion of smoked salmon, onions, capers and dill mayo. To finish the meal in true Swedish style, we tried the Raspberry Cream (SGD7.90) which I had a bit of a culture shock with, not knowing what to expect at all. This dessert consists of a raspberry puree, with cold milk, ice-cream and a dollop of whipped cream. It is interesting and I slowly liked it. I actually do the cold milk and ice-cream combination myself (I know, blasphemy to the ice-cream but it is really very delicious), but the raspberry puree mixed in was quite sweet. It is definitely a good experience to try out Swedish meal with this dessert! The service here is earnest and prompt. I've been here at the Millenia Walk outlet twice, and I've always heard good things about them. 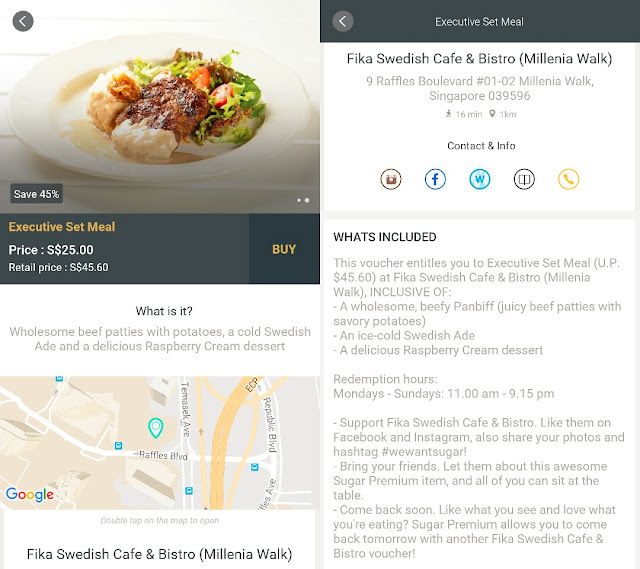 Now, you want to find out how to enjoy a Fika meal without having to pay the full prices as stated above? Download Sugar and try out their Premium incentives! You can purchase an Executive meal with Fika which includes the Panbiff that I tried (very similar to the meatballs, except for the shape), the raspberry cream dessert and a Swedish ale! All these for only $25. If you consider yourself a small to regular eater, you can share this deal with a friend and add one more side/salad to make a good portion. There are plenty of other Premium incentives for you to try out in the Sugar app too.